The Barber Institute of Fine Arts, situated on the university campus, boasts one of the finest small art collections in the country, showcasing works by Renoir, Monet and Van Gogh to name a few. Yet, the venue is further renowned for its regular classical music concerts which take place in its stunning concert hall, attracting both students and outside music-lovers alike. A long established tradition at the Barber is weekly Friday lunchtime concerts which are free admission and feature recitals and performances from the university’s thriving music scene. The latest of these concerts was a performance by the Birmingham University Singers, singing a mixture of English, Italian and German madrigals and part-songs. They were accompanied during their performance by Robert Tibay and Gerald Lim who provided a continuo. Their conductor was Professor Colin Timms, whose obvious passion and knowledge of the madrigal genre provided an insightful glimpse into a style of music that perhaps not all would have been previously accustomed with. The Madrigal has its roots in 16th Century Italy and is traditionally polyphonic in texture, unaccompanied and can feature up to eight separate vocal parts at a time. This leaves a great deal of scope for musical interpretation and the conductor works hard to ensure all parts are each given their own precedence amongst the array of contrasting chords and lyrical lines. This Friday’s concert featured an array of works by Monteverdi, Weelkes and part-songs by Brahms amongst others. As for the singer’s themselves, their performance was extraordinary and there were moments of incredible musical understanding and collective empathy with the choral works. Even at times when the ensemble were singing at full capacity, the sopranos’ vocals had an ability to cut through the mass of harmonies and soar to the back of the concert hall, which resulted in awed expressions and smiles on the faces of some attentive audience members. The biggest giveaway as to the success of the event was the very, very small number of spare seats in the concert hall. It seems that these Friday lunchtime concerts attract a wide following and have established a reputation which ensures listeners return to the University again and again. Even for the student populace, a chance to relax away from the glare of laptop screens and rigorous studying, I can imagine, is a welcomed relief. Before, I wondered why these concerts were perhaps not advertised widely but seeing the unbelievable turn-out it seems the Barber have little need to. What is also wonderful about these concerts is the evident number of individuals from outside the campus who come to enjoy the music the University displays. It shows that the University of Birmingham has a prominent placing in Birmingham’s classical music scene, already well established and linked with the prestigious Birmingham Conservatoire and the The CBSO Youth Orchestra. I strongly urge anyone, either with imminent deadlines or just an interest in classical music to go along to the next concert on Friday 10th February where the University Music Scholars will be performing. 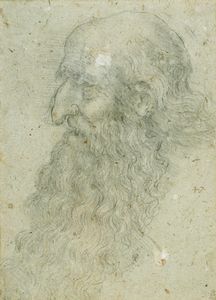 Birmingham Museum and Art Gallery is currently home to an exhibition of Ten Drawings by the Italian Renaissance polymath genius, Leonardo Da Vinci. It is a huge coup not just for the gallery, but also for culture in Birmingham as a whole. So it is with fervent anticipation that I ventured into the city centre to visit the early sixteenth century master. For those who have not visited Birmingham Museum & Art Gallery, it’s a grand imposing feat of architecture that really makes for a particularly dramatic journey on your way through to the Da Vinci room. Under the vast ceiling of the entrance hall, patrons are greeted by a statue of Lucifer, surrounded by a wall of different landscapes and shaking a spear. The Da Vinci exhibition is hidden deep in the bowels of the gallery, which is actually a masterstroke in terms of the layout: this allows time for visitors to contextualise Da Vinci in terms of all the art, culture and history, both before and since his time. Walking through the gallery almost creates a montage effect of the past 600 years of human history, whilst building the anticipation of seeing the work of a true undeniable genius up close. Finally in the room with the Leonardo Da Vinci exhibition, there was a tangible sense of reverent religiosity amongst the thirty or so patrons in the room, as though talking too loudly would damage the drawings. Certainly there was no question of flash photography because the images are over 500 years old and vulnerable to damage from exposure to bright lights. Perhaps most unusual about the exhibition is that, despite being beautiful, the works were clearly never intended for display. A striking contrast from Da Vinci’s iconic works such as the Mona Lisa or the Last Supper, instead this royal collection serves more as a narrative of his life and work. For a start most of them are not works of art at all but sketches and diagrams of academic interest. 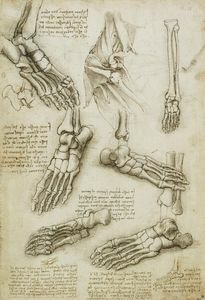 There are designs for weapons, chariots, maps, precise anatomical drawings of dissected humans, plants and even designs for men’s fashion. The wide cross section on display gives an insight into Da Vinci’s great, curious, enquiring mind: his fascination with and ability to excel in so many fields is irrefutably inspiring. The anatomical diagrams displayed on two sides of a glass case are particularly impressive. They are drawn so precisely and accurately that it is possible to catch a glimpse of a great empiricist brain at work. The closer I looked at one of them, the more I noticed ink bleeding through the page, only to then realise that these two masterpieces were scribbled down on either side of one piece of paper. To Da Vinci, they were just scraps of sketches drawn on rag paper, but to us they are priceless and infinitely precious testaments to human endeavour. 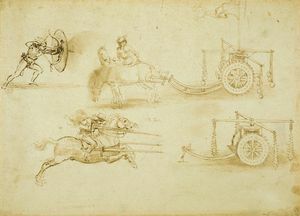 The drawings hang in roughly chronological order, each with a short synopsis beside it providing a vague biography of Da Vinci and explaining the origin of the work. This becomes unexpectedly moving at the end of the cycle where we see drawings he made as an elderly man. It is disheartening to see the brilliant enquiring genius somewhat lose that curiosity that made him so vital, moving to becoming obsessed with drawing old bearded men and apocalyptic scenes. It is a deeply melancholic end to the collection, reflecting on ageing and death. One leaves the gallery not only with a respect and admiration of Da Vinci, but also with a feeling of kinship with him as a mortal fallible man. The exhibition opened on Friday 20th of January and now, a week later, the huge initial crowds have largely subsided. The main room was busy, but with a quiet contemplative atmosphere and the gallery was dotted with a few rather sad forgotten looking ‘Da Vinci queue’ signs. Nevertheless, now is the time to go and fully appreciate Leonardo Da Vinci’s work without having to queue or travel to Italy. The collection is in Birmingham until the 25th of March so there is definitely no excuse for missing it.